This is not so much a recipe as a method. Really, you can use any combination of greens/fruits that suits your fancy; you can also add sugar (although that would totally kill the nutrition factor), honey, agave, or another sweetener if you so desire. For me, the 100% OJ concentrate, plus the banana, sweetens it up just fine. This is the smoothie that I make every morning; it yields 4 cups. 5. Turn the blender off. Add in 1/2 banana (fresh or frozen), 1-2 Tbsp 100% orange juice concentrate, a handful of frozen strawberries (I probably do about 6-8 strawberries), and some frozen blueberries (I probably do about 1/4-1/3 cup blueberries). Pulse blender again to get the big chunks broken up, then blend on highest setting for another minute until smooth. If the smoothie gets too thick to blend, add in another tablespoon or two of hot water, stir it up, and blend it again. When it's done, I usually taste it to see if it needs something else—more OJ, fruit, etc. Like I said, this can be done with any combination of fruit. 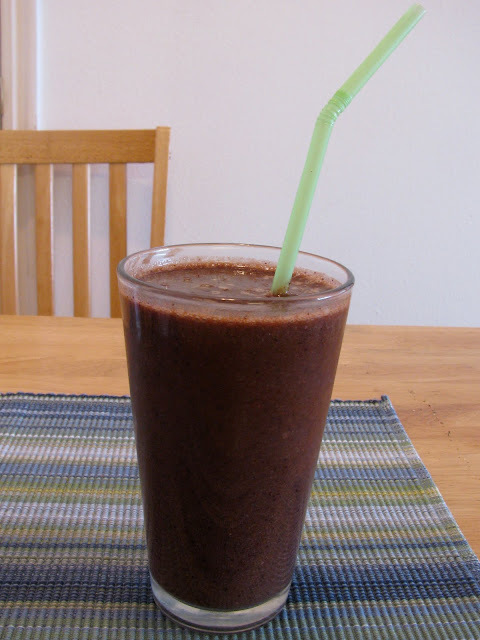 I use the berries and banana because they are a) cheap and b) very flavorful, and make a great balance to the spinach. I know my mom sometimes puts apples in hers, but apples are a precious resource in our house and aren't getting wasted on any old smoothie! When peaches & pears are in season, though, I plan to add some of those in as well. One last note—I do my grocery shopping every 2 weeks, which means it's hard to keep all the fresh stuff fresh. At the beginning of my grocery period, I will pull out some of my fresh spinach and put it into ziploc bags to freeze for the end of the grocery period, when the spinach tends to get wilty. Also, I will usually get about 7 bananas, enough for 2 weeks worth of smoothies. For the first week, I'll use half of a fresh banana every day, and freeze the other half... then when the second week rolls around (when the bananas would be brown), I use the frozen halves. Love the freezer tips and the estimated amounts. Thank you for sharing! No problem! Sorry the amounts are not more specific... to be honest, they vary from day to day! I just dump some in till it looks about right.